What happens when you combine 3 weekly challenges into one? I was looking through the challenges in 2018 and realized 3 challenges were already posted (and now a 4th today)! Looking at the topics of the first three, I pondered combining them into one solution. In the real world, we all do that daily; combine multiple ideas, approaches and technologies to create our e-learning. 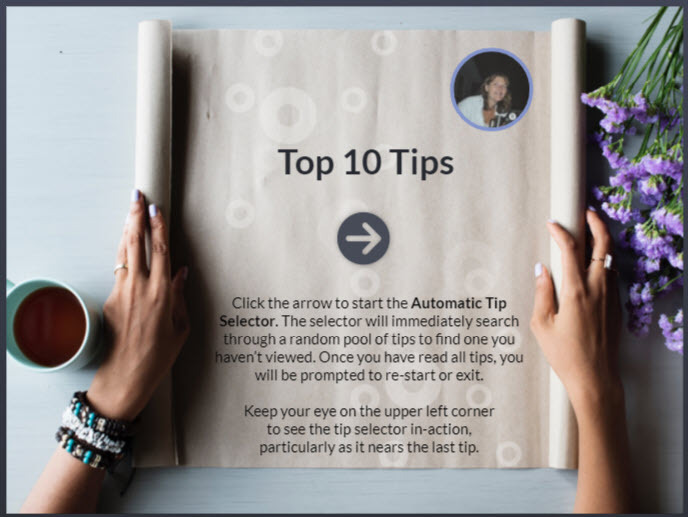 I created an Automatic Tip Selector that will draw from a random pool of my top 10 e-learning tips using the new random number trigger and display this in a circular format using a dial interaction. When you start the selector, Storyline will use the random number trigger to pick a number from 1 to 10. It will cycle through the number pool until it finds a tip that hasn’t yet been viewed. Once it finds a tip, clicking on the tip number displays the tip. Closing the tip returns to the selector where it works to find the next available tip. What a great way to combine the challenges Stephanie! Good to see you back. Thanks Linda. Nice to hear from you! Oh this is amazing, Stephanie! I'm sorry I missed this until today. I'll update the recaps to include your challenge trifecta! Interesting Stephanie! combination of three challenges works great and amazing output. Brilliant. Thanks for sharing the story file. Time for some backwards engineering me thinks. That was a really great example. I enkoyed going through it. This is a very good work.. I went through the work it is really awesome and a huge effort behind that..